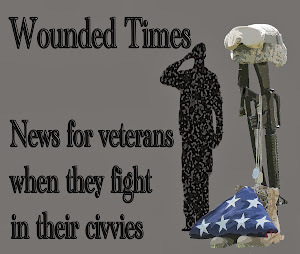 Someone got confused about the title of my site, Combat PTSD Wounded Times. This is what Combat means in it "take action to reduce, destroy, or prevent (something undesirable)" and you know what PTSD stands for. The Wounded is part of that because "trauma" is actually Greek for "wound" and I'm half Greek. The Times part is exactly that. There is a time for everything and while today may mean dealing with the wound, tomorrow may be the start of the healing of it. This is a way to heal! 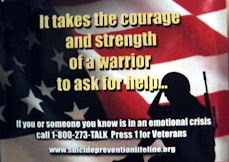 The Warrior Saw Suicides After War 2013 About 2012, highest military suicide year on record. 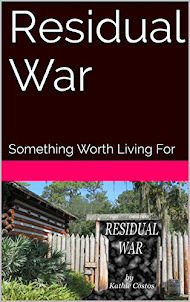 and Residual War, Something Worth Living For 2016 fiction to get people to pay attention to what is true within a make believe world. My family and friends told me to get divorced. 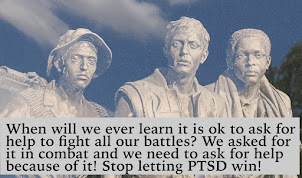 They didn’t understand what PTSD was no matter how hard I tried to explain it to them. They couldn’t understand why my daughter and I showed up at gatherings most of the time without him. In 1999, after years of fighting for Jack alone, I stated to feel the frustration. I was holding onto anger, unable to let go of it. 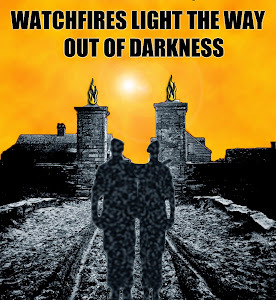 I needed to find someone to talk to with a true understanding of what PTSD was and what it was doing to me. It was great Jack was getting help but I wasn’t. Families were left out of everything. We didn’t have as many websites and online support groups. Finding others going through the same thing was easy but we were all just as lost as anyone else. I knew more than most but while I helped others, there was no one really there to help me. My family doctor suggested a few psychologist I should contact. After a couple of phone calls I managed to find a woman I knew I could talk to. Elaine Faunce of Appletreee Associates in Salem knew what I was going through and I knew she wouldn’t just tell me to get a divorce the way everyone else was telling me that would solve my problems. After the first appointment, she had me write my thoughts between then and the next appointment. I handed her back a page a week later. The next time it was a couple of pages. Soon I handed her over 30 pages. The following week, she handed them back to me and then said I had to turn it into a book because “There are too many other families out there just like mine.” Knowing she was right, I got to work in my spare time. By 2000 I was trying to find a publisher, but didn’t have any luck at all. 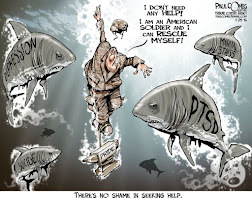 No one was talking about PTSD. Jonathan Shay was. He wrote "Achilles in Vietnam" and I contacted him about his wonderful book. He was trying to help me find a publisher, but again, no one was interested. When September 11th came, I decided I was going to give up trying to get it published the regular way and decided to self publish. The rest, as they say, is history. 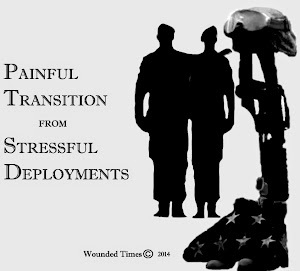 After many websites and blogs, I developed Wounded Times Blog in 2007 after an email from a Marine set my feet on the straight path again. He reminded me of why I do what I do and it wasn’t about politics or what divides us. It is about what we all have in common. This is a huge family of veterans, family members and the active members of the military few news sites think about. I think about them everyday. When I was 23, I had the same problems everyone else my age did. At least that was what I thought. Then I met someone who opened up my eyes to a group of people I never thought twice about. Combat veterans. Really stupid when you think about it considering I grew up with veterans all my life. I never really thought about any of my relatives being different until my friends told me they didn't have any veterans in their families. At least that's what they said at the time but later on they thought about their uncles and grandfathers, suddenly it dawned on them they were related to a part of history. I was about to enter into a smaller group I was not prepared for. 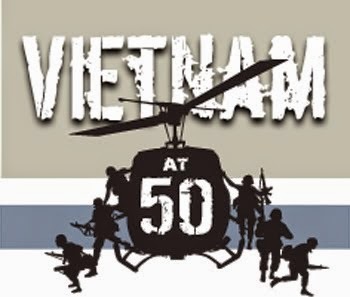 Vietnam veterans. Back then there was nothing for me. The internet didn't exist in my house and no one I knew had a computer. Veterans and their families were all isolated, discovering others in smoky DAV and VFW halls, usually opening up with a few drinks. 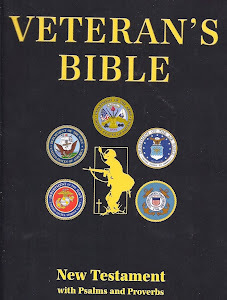 What I learned about PTSD and veterans came from clinic books. At the time there was nothing considered "self help" in book stores or in the library. I was alone. Alone even in my own house. My Dad said that Jack seemed like a really nice guy, "but that guy has shell shock." Fast forward 30 years. 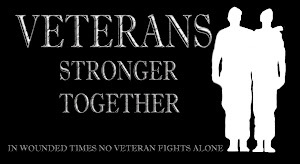 We're still together and I'm still helping veterans. 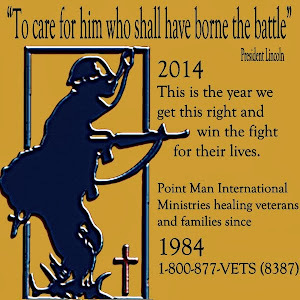 If you want to make your life easier living with a veteran, then I'm here for you. My book covers 18 years of my life and most of it has been an "open book" online in one form or another for 20 years. This blog has been up for 5 years as of August. It's all here to use. So are my videos that you can find at the top tab. Everyone keeps asking me why I do what I do and I simply say I do it for Jack. Now you may feel lost in the mess online and I understand that. While I had no information to lean on, there is too much today and no one knows who to trust or where to go. That is one reason why this blog is here. I track reports around the country from news sources and not blogs. You get facts and you get my two cents that you can skip over, laugh at or get angry about. You also get some up to date resources to turn to. Wife, mother, veterans advocate and writer. Kathie lived with her family in New England until the move to Florida in 2004. She has researched Post Traumatic Stress Disorder and the Vietnam War for 30 years while seeking to understand her husband and the illness that tried to claim his life. Kathie is a chaplain specializing in trauma and crisis intervention. 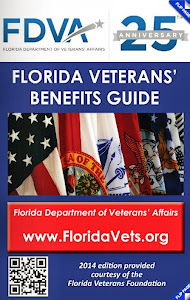 A lifetime member of Disabled American Veterans Auxiliary, chosen State of Florida Member of the Year in 2012 for her works on Post Traumatic Stress Disorder and military families. 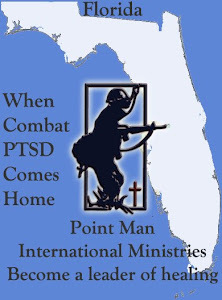 She is also Florida State Coordinator of Point Man Ministries. Kathie has been creating videos since 2005 to reach all generations of veterans and maintains a news blog at called Wounded Times Blog. Jack wanted to be like his father so he joined the Army’s 101st Airborne Division during the Vietnam War. In 1970 his life changed when Camp Evans was attacked for two hours by mortar rounds during Thanksgiving. After a year he returned home forever changed by the ghosts that followed him. Jack needed a miracle. Kathie was too young to remember much about Vietnam. She was battling her own ghosts from the years her father suffered as an alcoholic to her abusive first marriage that ended with a messy divorce. She wanted to be what Christ taught she should be, filled with compassion and forgiveness. Kathie thought her bleeding heart liberalism was a gift from God. Pain felt deeply was a price she was willing to pay for the abundance of joy she received so many times in return. 10 Years after Jack came home from Vietnam he found his angel in Kathie’s eyes. Her faith in him and God made the following eighteen year struggle worth it all. From researching the war and the illness Post Traumatic Stress Disorder to years of fighting her family who wanted her to get divorced. Through the years of fighting the government to give Jack the help he needed. The years of fighting her husband who could not find the will to fight for himself. Kathie knew she had to be the one to fight for Jack and her family because he could not find it in himself to think he deserved anything. 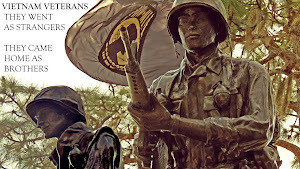 She had to fight to keep hope alive that their lives would not be dictated by the ghosts of Vietnam. She fought them all because Vietnam was his war but it became her battle. 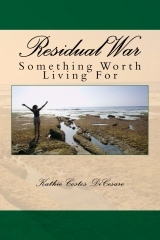 Kathie opens her heart and her soul in their story. When asked why she wrote it, she simply states, “If I can get strangers to care about Jack I have done my job.” She knows that if people care about anything they want to learn about it. 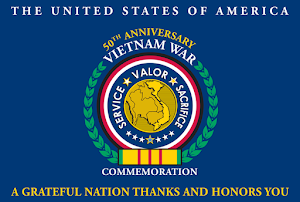 There is so much that “normal people” do not know about Vietnam or the veterans who serve this country. Too many are simply numbers and need a human face to make their lives personal. 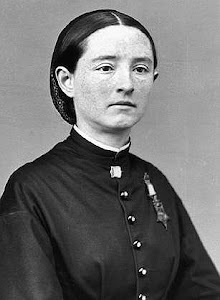 She showed the heart break and the depth of despair along with the overwhelming glory of vindication and justice with a renewed vow to fight for all those like Jack. Throughout it all she learned that there were too many others out in the world just like her family. Some were lucky enough to find the strength to stay together, while others were forced to separate. 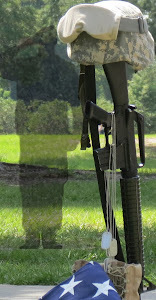 Many, far too many, did not understand what Post Traumatic Stress Disorder was and were unable to cope. 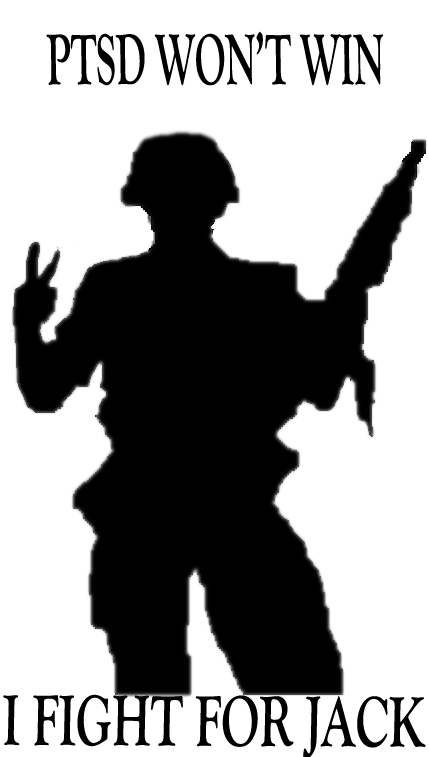 The government estimated that 500,000 Vietnam veterans had been afflicted with PTSD. The numbers are now joined by returning troops from Afghanistan and Iraq at a rate of one out of five. 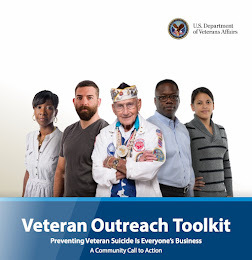 By the time this work was finished, there were 28,000 already diagnosed by the VA. The illness is tough enough to go through on the person as well as anyone who cares about them. It is not a hopeless illness provided that treatment and understanding are in place to offer the desperate support needed to heal for all involved. Kathie and Jack found there own kind of normal and are living proof that the magnificence of the human soul can beat anything. In September of 2013 they have been married for 30 years. 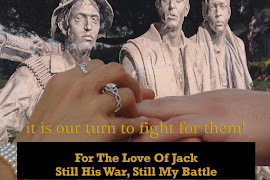 This is the 10th anniversary edition of For the Love of Jack, His War/My Battle! 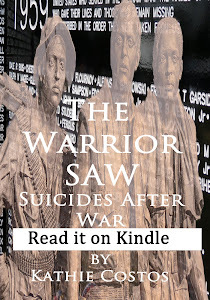 If the powers that be kept the focus on healing that really worked, there would have been no need to write the second book The Warrior SAW, Suicides After War. Donation link gone because no one bothered to help. I love your beautiful heart! 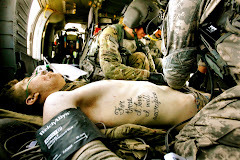 It is warm, courageous, loyal, and loving. While some folks, including family, may not have understood your reason for sticking by Jack's side, in your spirit, you knew and you were guided by the Heavenly Father. May you continue to have such strength; not just for others but for yourself at times you might need it. But remeber the Lord is right by our side and carries our yoke and helps us on a straight path.Father God loves us so very much, even whe. We May not be tuned in and feeling Him. Bless you! bless you! bless you! Your treasures are surely in heaven! 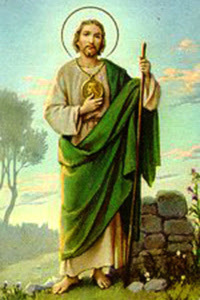 May you be blessed in countless ways upon this earth as well! Love you sister, even though we've never met. May our spirits meet some day in the heavens. You just made me cry! Thank you for blessing my day. It gets hard at times to remember that this work began because God used what was painful to turn it into something good. Hard to believe that we have been "us" longer than we were without each other.